Hannis, S, and Gent, C. 2017. 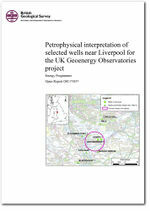 Petrophysical interpretation of selected wells near Liverpool for the UK Geoenergy Observatories project. British Geological Survey Internal Report, OR/17/037. This page was last modified on 7 March 2018, at 13:56.